1 Basic Mold Prevention Mold is a form of fungi and a part of nature. Just as other plants produce seeds to reproduce themselves, mold produces tiny spores to reproduce itself. These spores are floating through outdoor and indoor air and water at almost all times. Mold spores need three things in order to grow: moisture, nutrients, and warm temperatures. Warm and humid weather provides excellent conditions for mold to grow. This is why we have more mold problems in Florida than in cooler and drier states. Mold can have harmful effects on human health. We can be exposed to mold either by touching it or by breathing air that contains mold spores. This exposure may cause allergic symptoms and health problems. Reactions differ from person to person, but can include sneezing, coughing, runny nose, sinus problems, nosebleeds, asthma, skin and/or eye irritation, headaches, difficulty concentrating, and even memory loss. Mold is also destructive to buildings and property. When mold spores grow, they decompose and digest the surface that they are growing on. This results in damage to buildings and discoloration and deterioration of furniture, books, and other items. 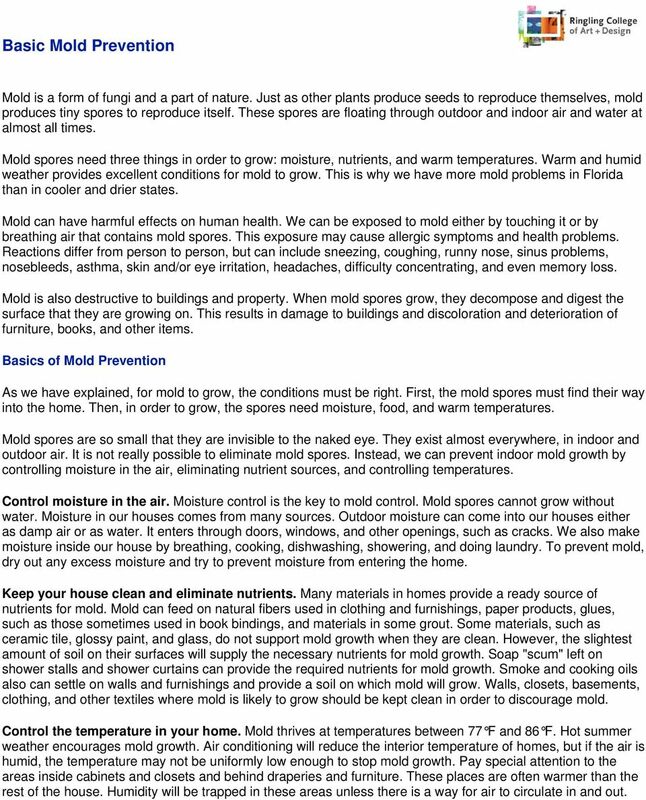 Basics of Mold Prevention As we have explained, for mold to grow, the conditions must be right. First, the mold spores must find their way into the home. Then, in order to grow, the spores need moisture, food, and warm temperatures. Mold spores are so small that they are invisible to the naked eye. They exist almost everywhere, in indoor and outdoor air. It is not really possible to eliminate mold spores. Instead, we can prevent indoor mold growth by controlling moisture in the air, eliminating nutrient sources, and controlling temperatures. Control moisture in the air. Moisture control is the key to mold control. Mold spores cannot grow without water. Moisture in our houses comes from many sources. Outdoor moisture can come into our houses either as damp air or as water. It enters through doors, windows, and other openings, such as cracks. We also make moisture inside our house by breathing, cooking, dishwashing, showering, and doing laundry. To prevent mold, dry out any excess moisture and try to prevent moisture from entering the home. Keep your house clean and eliminate nutrients. Many materials in homes provide a ready source of nutrients for mold. Mold can feed on natural fibers used in clothing and furnishings, paper products, glues, such as those sometimes used in book bindings, and materials in some grout. Some materials, such as ceramic tile, glossy paint, and glass, do not support mold growth when they are clean. However, the slightest amount of soil on their surfaces will supply the necessary nutrients for mold growth. Soap "scum" left on shower stalls and shower curtains can provide the required nutrients for mold growth. Smoke and cooking oils also can settle on walls and furnishings and provide a soil on which mold will grow. Walls, closets, basements, clothing, and other textiles where mold is likely to grow should be kept clean in order to discourage mold. Control the temperature in your home. Mold thrives at temperatures between 77 F and 86 F. Hot summer weather encourages mold growth. Air conditioning will reduce the interior temperature of homes, but if the air is humid, the temperature may not be uniformly low enough to stop mold growth. Pay special attention to the areas inside cabinets and closets and behind draperies and furniture. These places are often warmer than the rest of the house. Humidity will be trapped in these areas unless there is a way for air to circulate in and out. 2 Everyday Mold Prevention Tips As we have shown, the best way to prevent mold growth in your house is to keep your house clean and dry. Here are some more tips from experts to prevent mold growth: Clean your house regularly. Remove food stains from furniture as quickly as possible. Clean showers and tubs weekly (or more often) so that mildew cannot grow on soap scum and moisture. Use fans to circulate the air. Keep closet doors open so air will circulate. Check the temperature and humidity in your house regularly. 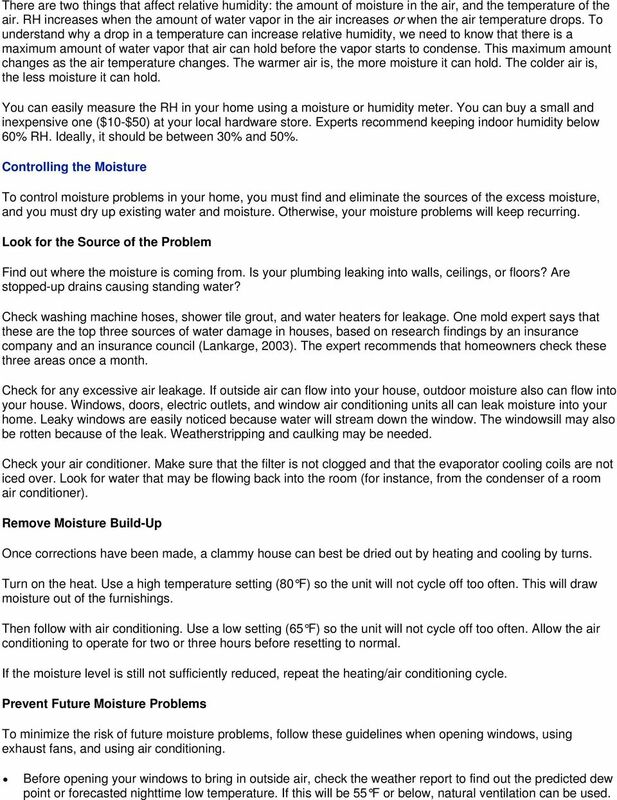 Try to keep indoor humidity below 60% relative humidity (ideally, it should be at 30-50%). Use a moisture or humidity meter to measure the relative humidity level. You can buy a small and inexpensive one at your local hardware store. Watch for condensation and wet spots. Fix moisture problems as soon as possible. Fix leaky plumbing. Perform regular heating, ventilation, and air conditioning (HVAC) inspections and maintenance. Keep HVAC drip pans clean, flowing properly, and unobstructed. Clean and dry wet or damp spots within 48 hours. Don't let foundations stay wet. Provide drainage, and slope the ground away from the foundation. 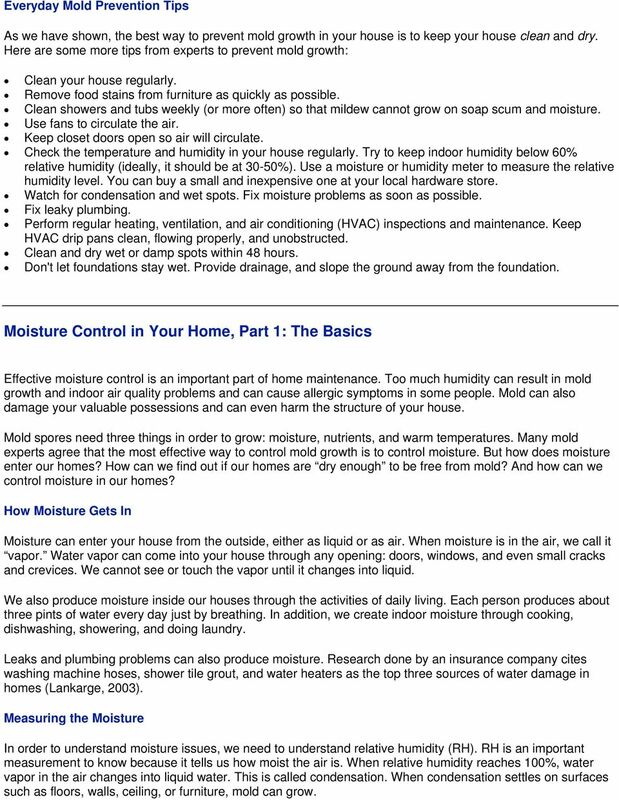 Moisture Control in Your Home, Part 1: The Basics Effective moisture control is an important part of home maintenance. Too much humidity can result in mold growth and indoor air quality problems and can cause allergic symptoms in some people. Mold can also damage your valuable possessions and can even harm the structure of your house. Mold spores need three things in order to grow: moisture, nutrients, and warm temperatures. Many mold experts agree that the most effective way to control mold growth is to control moisture. But how does moisture enter our homes? How can we find out if our homes are dry enough to be free from mold? And how can we control moisture in our homes? How Moisture Gets In Moisture can enter your house from the outside, either as liquid or as air. When moisture is in the air, we call it vapor. Water vapor can come into your house through any opening: doors, windows, and even small cracks and crevices. We cannot see or touch the vapor until it changes into liquid. We also produce moisture inside our houses through the activities of daily living. Each person produces about three pints of water every day just by breathing. In addition, we create indoor moisture through cooking, dishwashing, showering, and doing laundry. Leaks and plumbing problems can also produce moisture. Research done by an insurance company cites washing machine hoses, shower tile grout, and water heaters as the top three sources of water damage in homes (Lankarge, 2003). Measuring the Moisture In order to understand moisture issues, we need to understand relative humidity (RH). RH is an important measurement to know because it tells us how moist the air is. When relative humidity reaches 100%, water vapor in the air changes into liquid water. This is called condensation. When condensation settles on surfaces such as floors, walls, ceiling, or furniture, mold can grow. 3 There are two things that affect relative humidity: the amount of moisture in the air, and the temperature of the air. RH increases when the amount of water vapor in the air increases or when the air temperature drops. To understand why a drop in a temperature can increase relative humidity, we need to know that there is a maximum amount of water vapor that air can hold before the vapor starts to condense. This maximum amount changes as the air temperature changes. The warmer air is, the more moisture it can hold. The colder air is, the less moisture it can hold. You can easily measure the RH in your home using a moisture or humidity meter. You can buy a small and inexpensive one ($10-$50) at your local hardware store. Experts recommend keeping indoor humidity below 60% RH. Ideally, it should be between 30% and 50%. Controlling the Moisture To control moisture problems in your home, you must find and eliminate the sources of the excess moisture, and you must dry up existing water and moisture. Otherwise, your moisture problems will keep recurring. Look for the Source of the Problem Find out where the moisture is coming from. Is your plumbing leaking into walls, ceilings, or floors? Are stopped-up drains causing standing water? Check washing machine hoses, shower tile grout, and water heaters for leakage. One mold expert says that these are the top three sources of water damage in houses, based on research findings by an insurance company and an insurance council (Lankarge, 2003). The expert recommends that homeowners check these three areas once a month. Check for any excessive air leakage. If outside air can flow into your house, outdoor moisture also can flow into your house. Windows, doors, electric outlets, and window air conditioning units all can leak moisture into your home. Leaky windows are easily noticed because water will stream down the window. The windowsill may also be rotten because of the leak. Weatherstripping and caulking may be needed. Check your air conditioner. Make sure that the filter is not clogged and that the evaporator cooling coils are not iced over. Look for water that may be flowing back into the room (for instance, from the condenser of a room air conditioner). Remove Moisture Build-Up Once corrections have been made, a clammy house can best be dried out by heating and cooling by turns. Turn on the heat. Use a high temperature setting (80 F) so the unit will not cycle off too often. This will draw moisture out of the furnishings. Then follow with air conditioning. Use a low setting (65 F) so the unit will not cycle off too often. Allow the air conditioning to operate for two or three hours before resetting to normal. If the moisture level is still not sufficiently reduced, repeat the heating/air conditioning cycle. Prevent Future Moisture Problems To minimize the risk of future moisture problems, follow these guidelines when opening windows, using exhaust fans, and using air conditioning. Before opening your windows to bring in outside air, check the weather report to find out the predicted dew point or forecasted nighttime low temperature. If this will be 55 F or below, natural ventilation can be used. 4 Use exhaust fans for short periods for odor and moisture removal. Remember, though, that during humid weather, outside air may hold more moisture than inside air. Ten minutes of fan operation will remove most of the moisture from the air after bathing or showering. During humid weather, run your air conditioning regularly rather than opening windows. Use the slowest air conditioner fan speed available on your air conditioner. 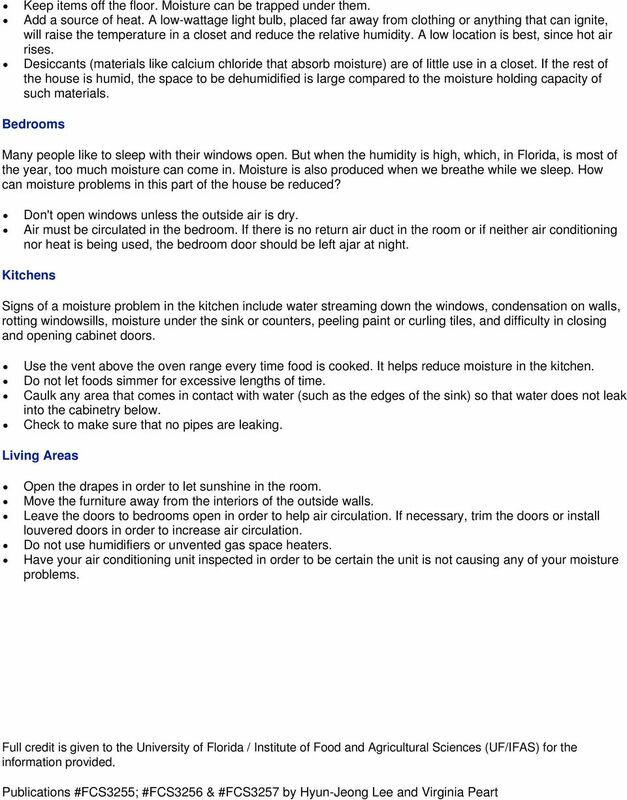 Moisture Control in Your Home, Part 2: Room by Room Tips Effective moisture control is an important part of home maintenance. Too much humidity can result in mold growth and indoor air quality problems and can cause allergic symptoms in some people. Mold can also damage your valuable possessions and can even harm the structure of your house. Mold spores need three things in order to grow: moisture, nutrients, and warm temperatures. Many mold experts agree that the most effective way to control mold growth is to control moisture. But how does moisture enter our homes? How can we find out if our homes are dry enough to be free from mold? And how can we control moisture in our homes? 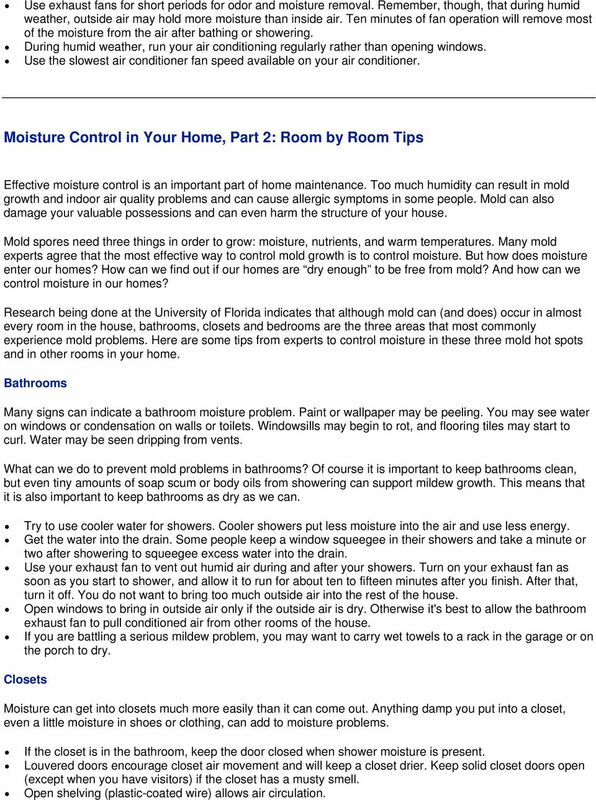 Research being done at the University of Florida indicates that although mold can (and does) occur in almost every room in the house, bathrooms, closets and bedrooms are the three areas that most commonly experience mold problems. Here are some tips from experts to control moisture in these three mold hot spots and in other rooms in your home. Bathrooms Many signs can indicate a bathroom moisture problem. Paint or wallpaper may be peeling. You may see water on windows or condensation on walls or toilets. Windowsills may begin to rot, and flooring tiles may start to curl. Water may be seen dripping from vents. What can we do to prevent mold problems in bathrooms? Of course it is important to keep bathrooms clean, but even tiny amounts of soap scum or body oils from showering can support mildew growth. This means that it is also important to keep bathrooms as dry as we can. Try to use cooler water for showers. Cooler showers put less moisture into the air and use less energy. Get the water into the drain. Some people keep a window squeegee in their showers and take a minute or two after showering to squeegee excess water into the drain. Use your exhaust fan to vent out humid air during and after your showers. Turn on your exhaust fan as soon as you start to shower, and allow it to run for about ten to fifteen minutes after you finish. After that, turn it off. You do not want to bring too much outside air into the rest of the house. Open windows to bring in outside air only if the outside air is dry. Otherwise it's best to allow the bathroom exhaust fan to pull conditioned air from other rooms of the house. If you are battling a serious mildew problem, you may want to carry wet towels to a rack in the garage or on the porch to dry. Closets Moisture can get into closets much more easily than it can come out. Anything damp you put into a closet, even a little moisture in shoes or clothing, can add to moisture problems. If the closet is in the bathroom, keep the door closed when shower moisture is present. Louvered doors encourage closet air movement and will keep a closet drier. Keep solid closet doors open (except when you have visitors) if the closet has a musty smell. Open shelving (plastic-coated wire) allows air circulation. HL 258 August 1998 RESIDENTIAL H O U S I N G Moisture: Build to Keep It Out of Homes in Warm, Humid Climates Water. It causes doors to stick, salt shakers to clog, draperies to sag, and odors to linger. FCS3042 How to Prevent and Remove Mildew 1 Virginia Peart 2 Mildew is a persistent problem in warm, humid climates and in many parts of the country where the humidity level is high during summer months. WITH A GOOD FAITH EFFORT BY BOTH TENANTS AND LANDLORDS, WE CAN KEEP MOLD OUTSIDE, WHERE IT BELONGS. MOLD GUIDANCE FOR TENANTS AND LANDLORDS (NOTE: Not applicable to Hot and Humid Climates) Many landlords and tenants do not understand why mold problems start and how to safely clean them up when they do. moisture and air Householder s Guide Problems and Remedies CmHC Home to Canadians Canada Canada Mortgage and Housing Corporation (CMHC) has been Canada's national housing agency for more than 65 years.